NETWORK UPDATE: THE BIG BANG THEORY, THE BLACKLIST and AMERICAN IDOL all gained 0.1 in final numbers. An additional note: quarter-hour numbers for AMERICAN CRIME reveal a somewhat troubling steady decline throughout the hour: 2.3/2.1/1.9/1.8. The drop at 10:15PM makes sense because some SCANDAL fans who tried it out would have decided to exit, but the continuing decline could suggest mixed word of mouth. Meanwhile, the newly-yanked ALLEGIANCE and the newly-moved (to 10PM) THE SLAP stayed at their previous 0.8s. The first installment of USA’s “event” limited series DIG found moderate success at 0.56, a tick above the previous night’s SUITS season finale. It was TNT’s turn for an NBA doubleheader last night, and the night’s games were at 0.85/0.66, with the primetime contest the top cable show of the night. It was followed by Syfy’s WWE show, up 0.07 to 0.81. VIKINGS (History) stabilized after last week’s big drop, down 0.03 to 0.79. 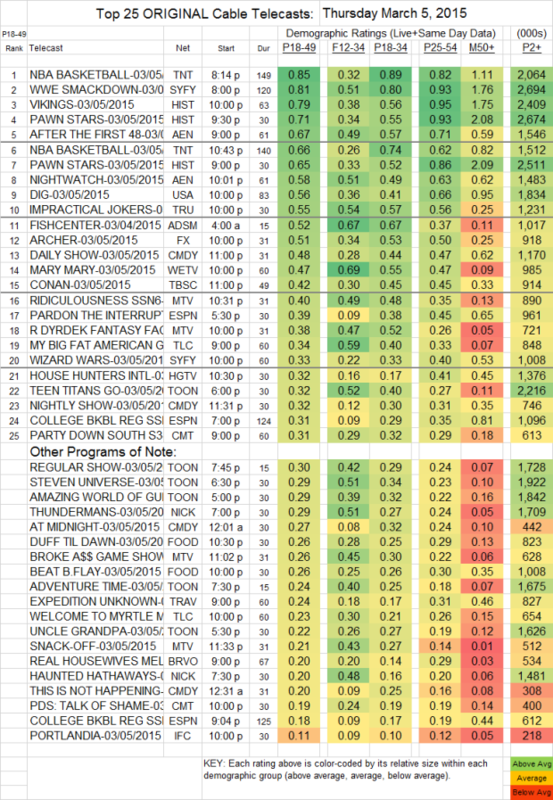 Lead-in PAWN STARS was at 0.71/0.65, essentially steady with last week. On A&E, AFTER THE FIRST 48 was at 0.67 (compared to 0.55 last week for THE FIRST 48), and NIGHTWATCH rose 0.12 to 0.58. Lots of people were up at 4AM for FISHCENTER (Adult Swim), which rose 0.12 from last Thursday to 0.52. ARCHER (FX) dropped 0.08 to 0.51. On MTV, RIDICULOUSNESS lost 0.12 to 0.40, ROB DRYDEK FANTASY FACTORY slipped 0.04 to 0.38, and BROKE A$$ GAME SHOW was steady at 0.26. UNCLE GRANDPA (Toon) lost a tenth to 0.22. Bravo’s REAL HOUSEWIVES OF MELBOURNE didn’t match the domestic variety at 0.20. PORTLANDIA (IFC) gained 0.02 to 0.11.